Recently, we have lots of order of Albion Gel Mask Foundation. 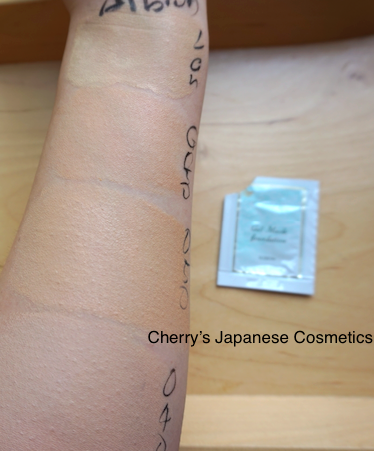 We also have questions of the shade, and the difference between Gel Mask Foundation and Tight Film Foundation. OK,ok. Let me show you one by one. 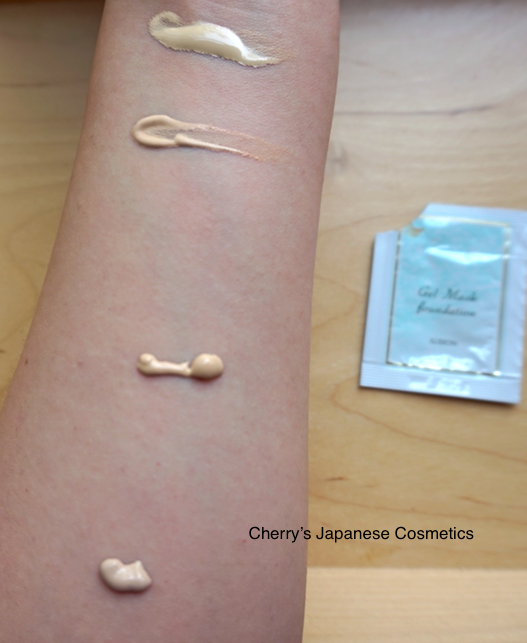 Tient Miracle is liquid foundation, and compared with this, both Gel Mask and Tight Film are harder, especially Tight Film never runs down on my arm. This is the very “Film”. Here you are. I took too much of Lancome 🙁 Anyway, you may see Lancome is setting their standard color in Japan more yellow to ochre. Albion is setting pinkish. Let me focusing on Albion. Seeing Gel Mask is more natural finish, and Tight Film is a little bit glow finish for me. I can not say the share of Gel mask #050 and Tight Film #050 are 100% the same. But it could be the difference of the quantity. When I reviewed the foundations one by one (see also Review of Gel Mask Foundation & Review of Tight Film Foundation ), I was surprised the coverage of Tight Film. But reviewing the foundations once, both are almost the same coverage. If you are looking for sheer coverage, both are not for you. 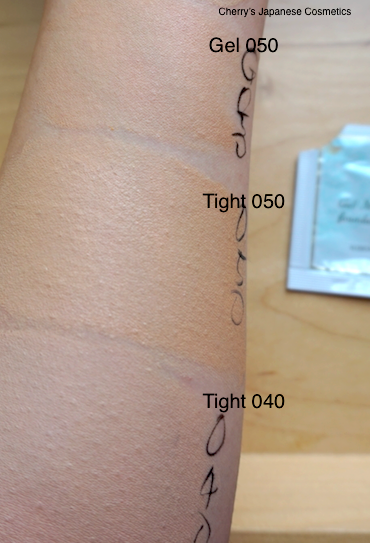 If you prefer middle/ medium coverage foundations, please spread thin layer. I was asked which is “natural”. You know… it is perfectly up to races 🙁 Both are categorized as “beige”. For Asian, #050 maybe more natural, and if you have less yellow factor, my recommend is #040. As I had shown you, we could obtain samples of #050 of Gel Mask Foundation, #040 & #050 of Tight Film Foundation. It is May now, and still it is dry. But we are facing rain season. Hot and humid Japanese Summer is 2 corners away. Cosmetics stores are already ready for Summer. In case of foundations, they are changed items from for dry season to for sunny & humid & sweat season. According to Albion, Gel Mask is including capsules of hyaluronic acid what keep your skin moist. This is for Autumn to Winter, the dry season. So, there were quite few samples of Gel Mask on the Albion dealer store, and #040 were already gone. Tight Film is the item of all season. They are focusing on the effect of “shaping your face up”. Japan is humid islands. I am a traveller, and I had been to South Korea, Hong Kong, Taiwan, Singapore, Kuala Lumpur, Michigan, Connecticut, New York, Nordic countries, Austria, and Germany on Summer. Japanese summer is drier than Hong Kong, Taiwan, Singapore and Kuala Lumpur, a little bit humid than South Korea, but MORE humid than MI, CT, and Europe. I felt it was not big difference between Manhattan and my place on mid summer, as I remember. Especially on Central Europe, it was super dry summer for me. It is what I wanna say that you have no need to hesitate to order Gel Mask Foundation in your mid summer. Especially Central Europe, it is SO dry for Japanese. And in Hong Kong, you use super strong air conditioner, and I know some of you have no need to go outside from your home to your office. For such people, moist type foundations are recommended. Please check the shades and prices: Albion Gel Mask Foundation (in JPY Branch), and Albion Tight Film Foundation (in JPY Branch). If you wanna try samples of Albion Gel Mask Foundation #050 or Albion Tight Film Foundation #050 (there are no #040 now), please feel free to ask us from the comment or “Contact us”. None can read your massage on the comment. We have to charge you the shipping and handling cost, it is up to the place to be shipped: Give you the example to the States and Australia, it is USD3 without tracking, and USD10 with tracking.